It's hard for me to believe it's been six years. But sure enough, it's been that and then some since our first Cobaya dinner with Chef Gabriel Fenton of Michael Mina's Bourbon Steak in Aventura, back in May 2010. That was only our sixth experiment, and in our eagerness to push chefs to work outside of their comfort zones, we told Gabe that he could cook whatever he wanted – as long as it wasn't steak. It was our bit of rebellion against the then-common trend of big-name chefs opening nothing but steakhouses in Miami. It was a great dinner, but man, was that dumb. We've been looking to make a repeat visit for some time, and it finally happened last week. This time around, we told Gabe – who I think is one of South Florida's most skilled chefs – he could really cook whatever he wanted. (Full set of pictures can be seen in this Cobaya Gabriel Fenton flickr set). 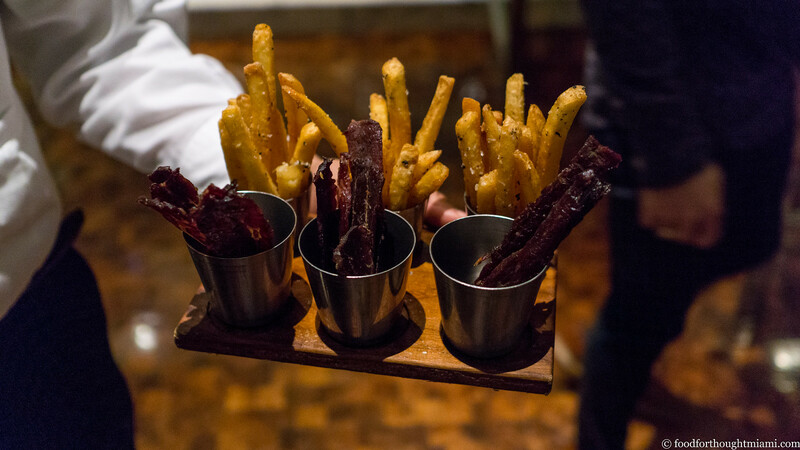 We started the same way every meal at Bourbon Steak starts: with some of their outstanding duck fat fries, here, dusted with truffle and accompanied by some candied bacon. While we usually insist that everything at our dinners be off-menu, these (1) are not actually on the menu at B.S. ; and (2) would be worth making an exception anyway. Also making the rounds as folks gathered at the bar was some hearty antelope chili, served with fingerling potato chips, and flavorful Florida grass-fed beef satay skewers. Once we settled into B.S. 's private dining room, dinner started with oysters a few different ways: Wianno oysters on the half-shell, garnished with ponzu and a brunoise of green apple, and also with crispy shallot and a coin of chorizo (? 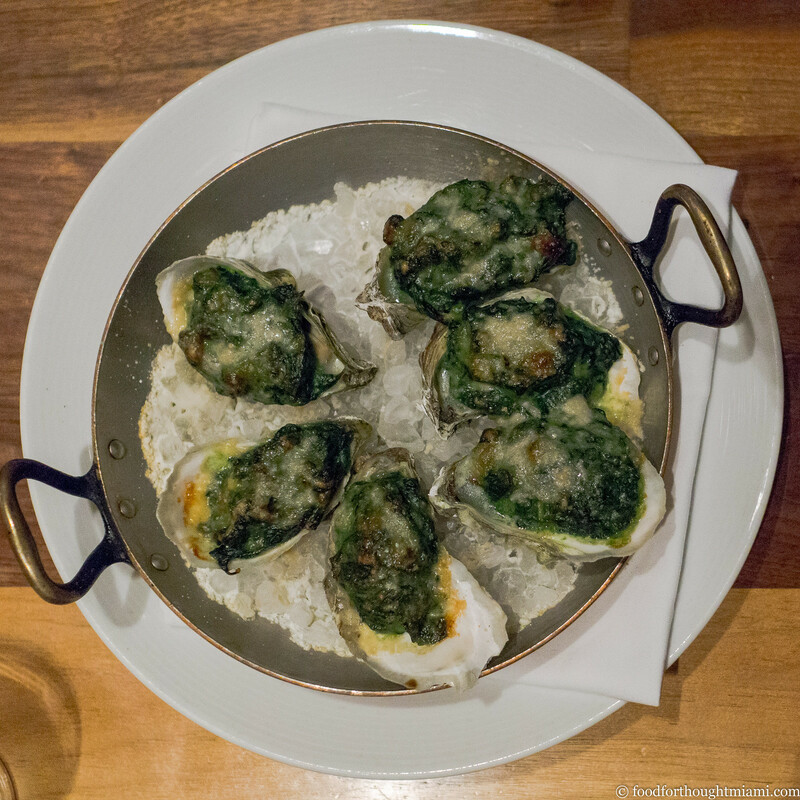 ); and, even better, a really excellent rendition of classic Oysters Rockefeller. Next, something you wouldn't likely ever find on the menu at Bourbon Steak, but executed at the exact same level: buffalo sweetbreads. 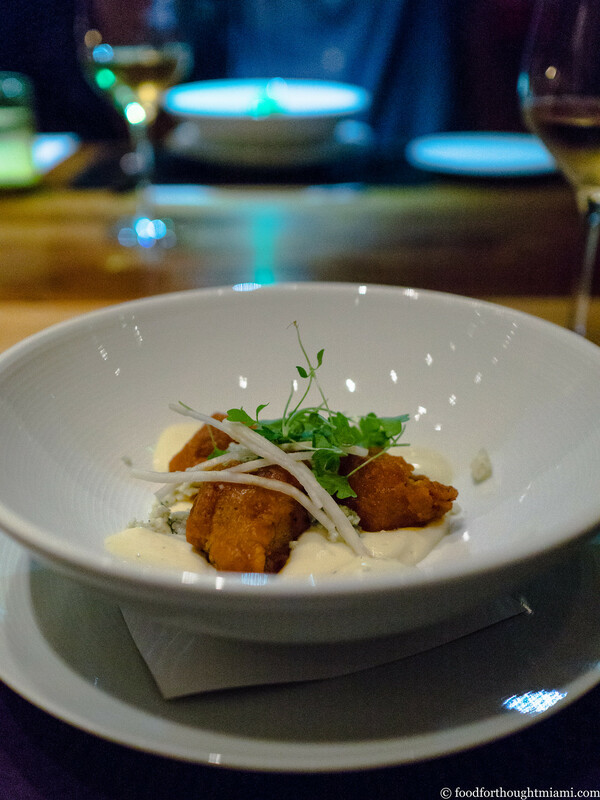 The delicate, cloud-like sweetbreads were encased in a crisp shell laced with hot sauce, and served over a silky celery root purée topped with crumbled Pt. Reyes blue cheese. As I mentioned in Part 1 of my Chile travelogue, before we'd decided to visit Chile, I knew very little about the country's food. In fact, there was only one restaurant I could name: Boragó. Boragó's chef, Rodolfo Guzman, opened the restaurant in 2007 after taking an interesting path into the kitchen: he studied chemical engineering, went to culinary school when a broken ankle ended a career as a professional water-skier, then spent time working at Andoni Luis Aduriz's restaurant Mugaritz in Spain's Basque Country before returning home to open his own place. It took several years, but eventually, Boragó drew the attention of the International Dining Mafia: it now ranks No. 37 on the "World's 50 Best Restaurants" list, and No. 4 among "Latin America's 50 Best Restaurants" – whatever the heck those rankings mean. I think the whole concept of these numerical rankings is goofy, before even addressing the many other valid criticisms lodged against the "50 Best" list. But it can still be a useful tool for finding restaurants, particularly in regions that don't get as much critical attention otherwise. One of those criticisms is that the restaurants on the list tend to have a certain sameness to them: high-end, expensive tasting menus, chasing the same fashionable ingredient trends, plated according to the same aesthetic. 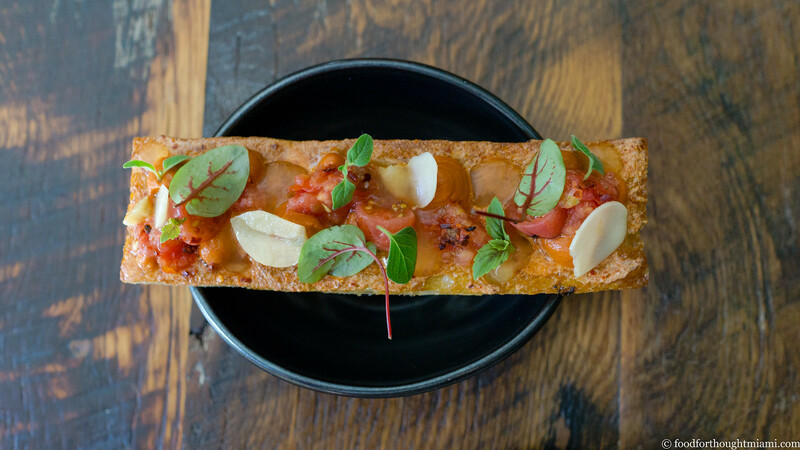 On the surface, Boragó might seem to fall into that camp: another pricey, tasting-menu place. But from its inception, Boragó set out to explore the largely unheralded ingredients and cooking methods of Chile's native peoples, and it dives deep. 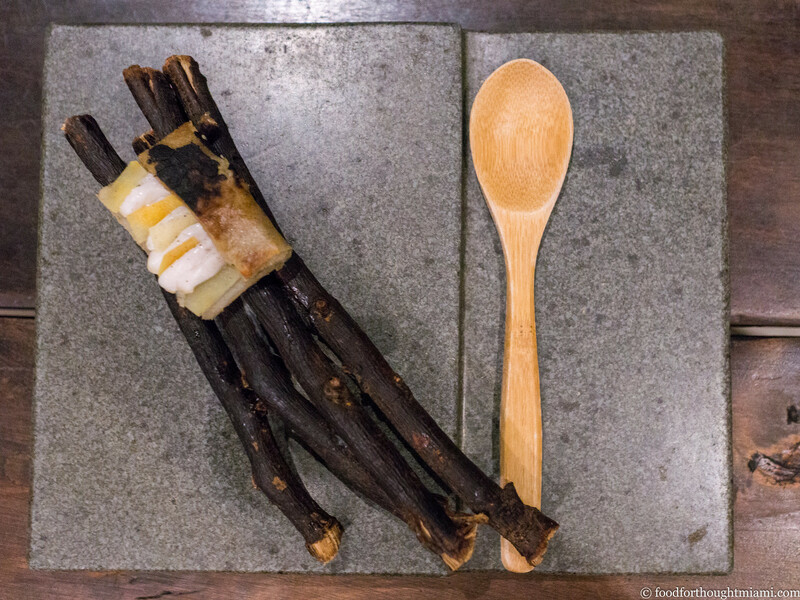 When you order the "Endemíca" tasting menu at Boragó, you are given not a menu, but a map: literally, a map of Chile, stretching along the Pacific coast of South America from the northern desert of Atacama to the Tierra del Fuego in the south, the last stop before Antarctica. My recap here reconstructs what I have gathered about our meal from the contemporaneous descriptions as they were presented (which came at us in a mix of English and sometimes rapid-fire Spanish, depending on who brought the dish to the table), Instagram posts from Chef Guzman, and some independent research after the fact. (You can see all my pictures in this Boragó - Santiago, Chile flickr set). 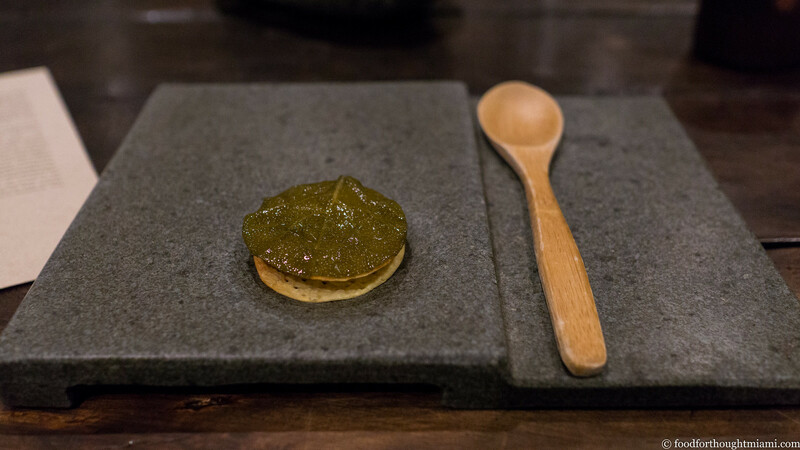 A "chilenito" is usually a sweet layered cookie like an alfajor filled with manjar (milk caramel, a/k/a dulce de leche); but here, as the first bite of the meal, it took the form of a thin, crisp cracker layered with creme fraiche, tart sea strawberry, and as the top layer, a preserved edible leaf. Sea strawberry would be the first of many ingredients I'd never encountered before. Called "frutilla de mar" in Chile, it's a coastal succulent with a tangy-sweet flavor that is indeed similar to strawberry, with a hint of salt. Even with after-the-fact googling, I couldn't figure out why this dish was called "chuchum" on the menu we received after the dinner. Served balanced on some branches, it was like a miniature tart in a potato shell with layers of locos (Chilean abalone), creme fraiche and membrillo. 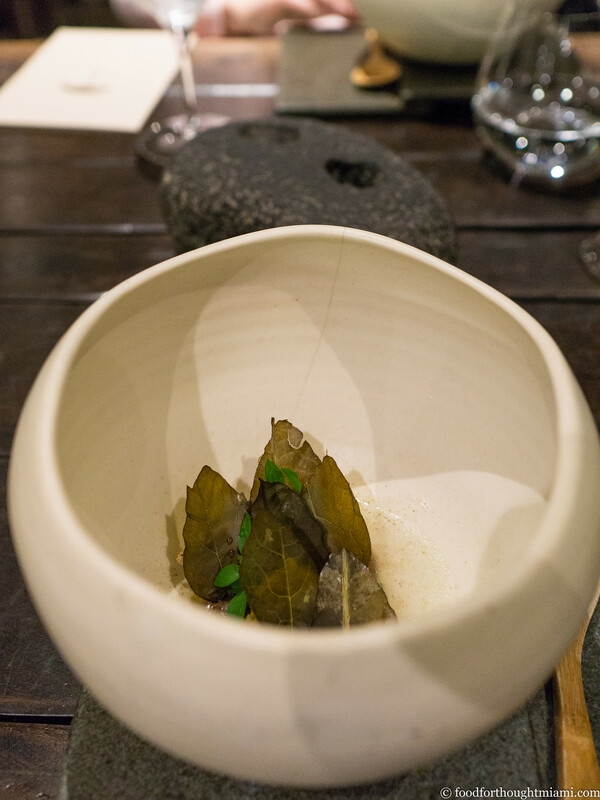 The next course was served in a wide ceramic bowl, which was brought to the table wrapped in cloth. 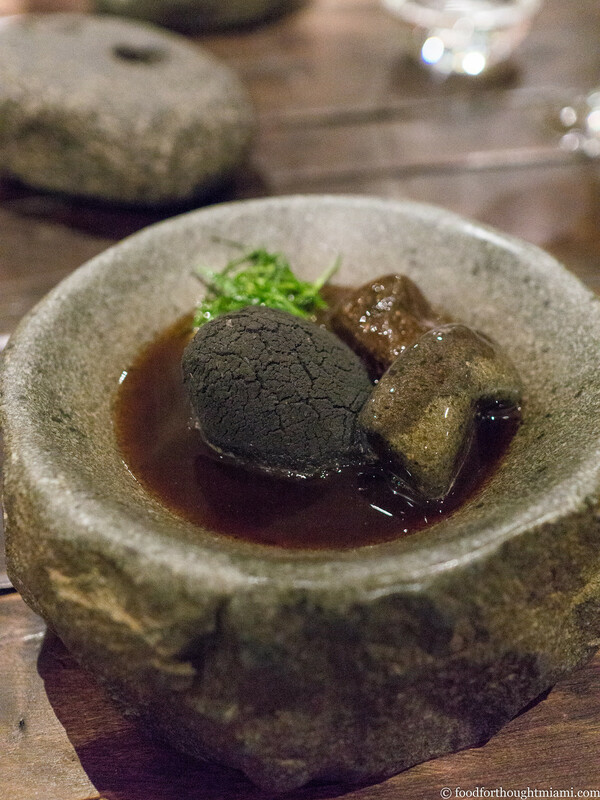 Inside the bowl was a "chupe" – a stew – of wild mushrooms from Quintay, a town on the Pacific coast due west from Santiago. At the base of the bowl was a thick purée of the richly flavored mushrooms, which had been hung over embers for five hours. Arranged above the purée were several pickled and dehydrated leaves. The server finished the dish by pouring into the bowl whey from pajarito (kefir?) yogurt which had been infused with eucalyptus. This was like the flavors of a forest, concentrated in one bowl: the earthy, meaty mushrooms, their flavors deepened over the smoke; the pickled leaves; the woodsy scent of eucalyptus, all of it pulled together in the lactic tang of the whey. It was a unique and memorable dish. Unfortunately, Saturday was the last lunch service at Alter, which is too bad: the 5-course lunch tasting for $39 was one of the best meals you will ever find at that price. (You can see pictures of the whole meal in this Alter - Lunch flickr set; the pan con tumaca was an extra sent out by the kitchen). But the trade-off will be a reinvigorated focus on dinner service at Alter, including an upcoming addition of some grilling stations outside to do some live fire cooking. Good things coming.